Public thank you on Social Media and a copy of my Doctors 2.0 report - almost as great as being there! We will also send a beautiful Certificate in Recognition of advancing South African health and medical technology. GOLD SPONSOR: All of the above AND A Madiba shirt, because as our founding father said: " It is only impossible until it is done" and an authentic, ethnic beaded African tin mug. PLATINUM SPONSOR: All of the above AND and an authentic, ethnic beaded African tin mug. Thank you for being one of the top sponsor's for my trip. A public thank you on the hcsmsa website on a sponsors page for his donation as a gold sponsor for making it possible to attend the conference as well as a mention on the social media platforms. A beautiful Certificate in Recognition of advancing South African health and medical technology. A social media page designed for you or your company (Facebook, Pinterest, Google+, linkedin or Twitter) by Artext. An embroidered logo or name on the shirt the patient wears to the #doctors20 congress. A Madiba shirt, because as our founding father said: " It is only impossible until it is done" and an authentic, ethnic beaded African tin mug and an African elephant ostrich egg. on Twitter- (Health Care Social Media South Africa) I received an invitation as a #ePatient guest to attend the #doctors20 congress in Paris, 5-6 June 2014, but I need your help to raise $3,000 to cover my travel expenses. By representing both facial difference patients and South Africa, I will be around thought leaders and a global community as we discuss the impact of the latest technologies between physicians, patients, and the healthcare systems around the world. I advocate strongly for social media and and being in person will build new connections as our #HCSMSA tweetchats and South African health continue to grow. 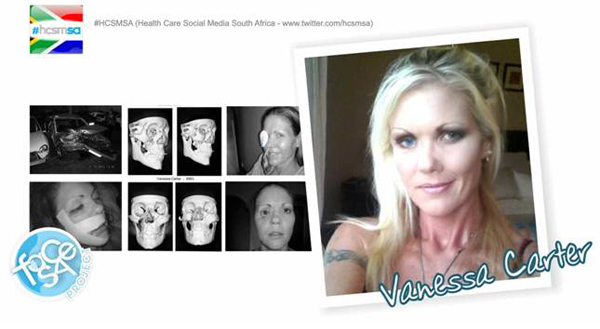 #HCSMSA represents Health Care Social Media South Africa. It is a non-funded project which hopes to be a means to advance healthcare in South Africa by providing a platform to curate information as well as collaborate and discuss health issues. Social Media is currently being used on international level to discuss health care topics by not only doctors and patients, but also by scientists, medical students, journalists and the like. Because of the advancement in medical technology, such as bio-printing, 3d-printing, robotics, googleglass etc. twitter in particular acts as the preferred platform for discussion and indexing in real-time, as opposed to most search engines, which can take several weeks to list an update. South Africa are in desperate need of turning their health care system around, especially with the rest of the world advancing at the rate that It is. In South Africa, parallel private health and public systems exist. The public system serves the vast majority of the population, but is chronically underfunded and understaffed. The current government is working to establish a national health insurance (NHI) system out of concerns for discrepancies within the national health care system, such as unequal access to healthcare amongst different socio-economic groups. What is Doctors 2.0™ & You? Social media, in particular Twitter, is being used in healthcare for a number of valuable reasons. One of the first is because of the growth in medical technology and because of the capability it offers to collaborate and network on a global level as well as share live developments. Mobile health #mHealth is now growing in Africa because of the issues in terms of access to public health especially for those in rural areas. Social media is a wonderful way in which to promote further advancement in this area. How has medical technology progressed globally? Medical technology has advanced at massive rates globally. Please help me raise funds to travel and attend the #doctors20 congress in Paris, before 16 May 2014, so that I can learn whatever I can about medical technology and the use of web 2.0 and social media in healthcare to help advance health to make it more accessible to patients in South Africa. Here are images of the great rewards you’ll receive when backing the project. Thank you for reading and learning more about my mission. We hope you pass on this camapiagn and fund my next mission to advance the use of social media in healthcare.